It's a texture pack that replaces the normal pokémon sprites from HG/SS to PMD pokémon sprites. Extract the rar file, then paste the two folders inside your ContentPacks folder inside the game folder, then, ingame, click on the pokéball icon at the top right corner of your menu screen and apply it. 4. 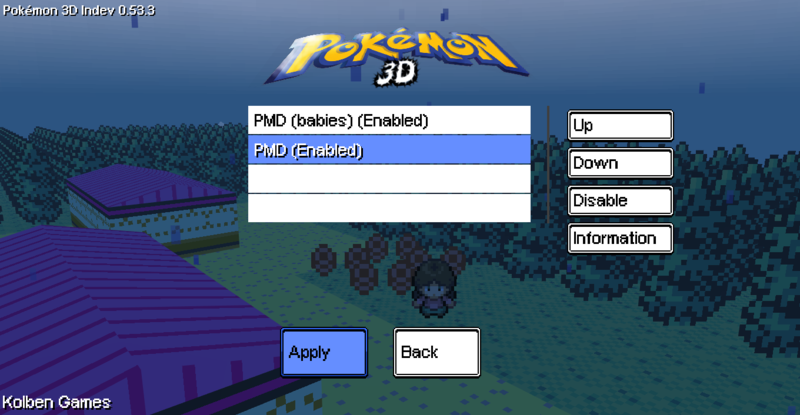 What this "PMD (babies)" does? It replaces the baby pokémon sprites with smaller sprites, so they look more like babies. 5. Pokémon A looks weird. PMD uses more than 2 frames animations, since Pokémon 3D is limited to 2 frame animations, some of the pokémons will look weird (almost as if they're dancing), but most of them will look ok. Anyway, if it's really bothering you, tell me and i'll see what i can do. 6. Pokémon B isn't here, and i know that he's on PMD! As of now, the texture pack is still a work in progress, so it's normal for some sprites not to be done, but if you have a request just tell me and i will work on it. 7. Can i use this to make my own texture pack/something? The textures are cool, but some sprites are too small and they look wierd. I would appreciate if you fix that. You probably have the babies version active, anyway, tell me, which sprites look weird?